Faith Evans dpnated this quilt to benefit SOTH's Farm to Table Apprenticeship Program. 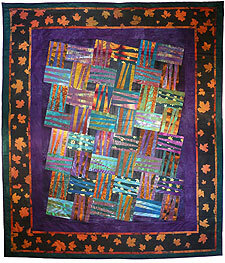 Editor's Note: The Gallery at The Garden, 157 Main St., is featuring a quilt exhibit during December. 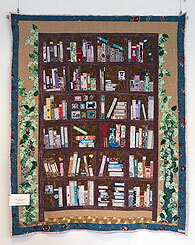 The dozen quilts in this show, some for sale, were made by local quilters and an innovative designer from Monkton, Vt. The River Garden is open Mon.-Fri. 9-5 and Sat. 12-4, except during special events. 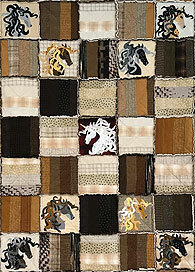 Information below was supplied by a few of the participating quilters for publication here. Carlene Raper, a Vermont resident since 1982, describes herself as a fabric artist. "I dye cloth, cut it up, and sew it back together." Carlene turns her beautiful hand-dyed cloth into quilts, hangings (from a few feet square to the giant twelve-foot tall tapestries decorating the Vermont Jazz Center), couch-sized "snuggle quilts," baby quilts, couch pillows, balsam pillows, and silk sarongs. She also produces notecards and wooden jigsaw puzzles from her designs. What ties all these together is color. 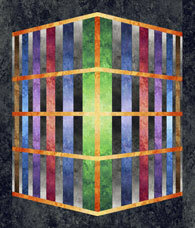 Blues, reds, purples, oranges, greens, yellows, blacks come together in an infinite variety. All of Carlene's work is dyed in her home studio, using sturdy cotton (except the silk sarongs) and fiber-active dyes that bond with the cloth. Hundreds of yards of hand-dyed cloth line the studio walls. She describes her dyeing as "play.... My dyeing has never been an exercise in control; I purposely let all sorts of chance affect the techniques. Maybe this goes back to my love of the materials; it's almost like a conversation with the fabrics: 'What do you want to be?'" Yet Carlene is a master craftswoman, with a dozen or more dyeing techniques at her command: ombre (basically, letting one patch of color smear gradually into another), rolling, shibori, stitch resist, clamp resist, monoprint, presist, masking, sueding, potato dextrin, discharge, stamping, breakdown silkscreen, salting, and the all-important "mop-up cloth" that finishes every dyeing session. For other dyers who would like to learn, all of these techniques are explained on her website, colorquilts.com. In the quilt featured at the River Garden, "Quadrille Boogie," you'll notice leaf shapes made by rolling black dye over an ombre cloth. 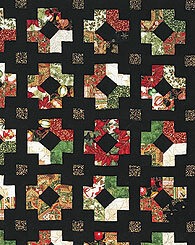 The "squares" in this quilt are not square, and are turned on a diagonal. 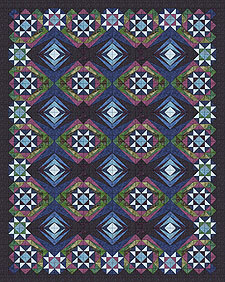 Few of Carlene's quilts follow standard patterns; instead, she has invented her own geometries: floating diamonds, water zigzag, and more. Carlene's puzzle "Celebrate," introduced last summer at ArtRageUs1, 57 Elliot St. This inventiveness comes naturally to Carlene. "I've taken a few workshops over the years, but almost all of my knowledge has come from experimentation and experience. I've always loved geometry, color, and cloth, and it seems that quiltmaking is the perfect marriage of these loves." Over the past few years, Carlene has developed a new line of work, wooden jigsaw puzzles. These are laser-cut puzzles featuring both images of her quilts and hangings, and cut patterns of her own design. The strength of wood allows extremely precise cutting impossible in a cardboard puzzle. So every piece has a different shape. 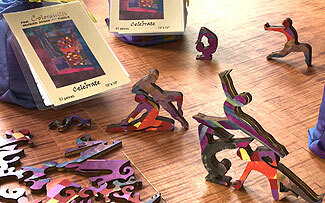 In addition the puzzles are full of "whimsies," small figures based on themes suggested by the artwork. For instance, "Colorfall," an abstract hanging, has whimsies of raining cats and dogs, a girl with an umbrella, plus fish and bones for the animals to eat. Of her attitude towards her work, Carlene says, "For many years I resisted the label 'artist.' One of my associations with 'art' was a certain preciousness, an attitude that 'this piece is my heart, my soul, it needs to be perfect... and when it's perfect, it really tears me apart to have to sell it!' My emphasis, my joy, is in the process rather than the result. I strive to make enjoyable, livable items for people to use, and that's the real satisfaction for me." Carla first learned to quilt by hand in 1976. She was a 24-year-old newbie, with no prior access to quilts, but she was bitten! She made quilts by hand for the next 30 years. Fast forward to 2006—new husband, new life, kids grown, business sold, move to Monkton, Vermont (near Middlebury).... And discovered the rotary cutter! For the first time she met other quilters, joined a guild, and visited quilt shops. Armed with her rotary cutter, 24" ruler, and cutting mat, and uninfluenced by 'rules' or modern methods, she developed her own ways to make quilts. These methods have been published as Shortcut Sheet Techniques. Carla also created the Talking Points block, a paper pieced zig-zag block that can be used by itself or with other quilt units to make complex and extraordinary quilts. She has designed many patterns using these methods, including three for AQS magazine, and travels around the U.S. to demo and teach at quilt shows, guild events, and retreats. Contact Carla Klop at (802) 377-0361 or by email at carla@kitsbycarla.com; visit online at kitsbycarla.com. I'm relatively new to quilting, but it has become my passion. I started quilting about three and a half years ago when my little dog, Polly, was diagnosed with cancer. I wanted to involve myself in a project that would take some time and that would be something I could do about her. We had spent the past 15 years together traveling around the world. I decided to make a quilt all about our travels, but I didn't know anything about quilting and was starting out totally green. Polly and I set out for the fabric store, where I bought a bunch of fabrics, threads, and new scissors, and came home to begin my project. Since I knew nothing about quilting, I did everything the long and hard way.... I cut every piece individually with scissors because I didn't know about rotary cutters. I pieced it together using my Brother sewing machine—I have since upgraded to a new Janome machine designed for quilting. After spending about five months hand-quilting it, I was hooked. I started watching quilting tutorials online, read quilting books, and started learning everything I could about fabrics and designers and manufacturers. I've taught myself how to do free-motion quilting with my machine and how to do ruler quilting. I love learning and practicing technical methods of piecework, and I really love doing appliqué work. At this point, I've made 23 quilts that vary in size from twin to queen. Showing four of my quilts at the River Garden Quilt Expo (Nov. 30-Dec. 1) and this month-long continuing exhibit is my first experience in a public forum. It has been both fun and exciting, and I have especially enjoyed meeting other quilters! My passion for quilting was born out of love for my dog. I now work on a quilting project every day. It is truly an art form—it's like painting with fabrics. A FAITH EVANS QUILT IS BEING RAFFLED TO BENEFIT S.O.T.H. I remember getting my first sewing machine when I was about 11 years old. (We won't get into how long ago that was, but I now have four lovely grandchildren.) I began by sewing clothes, then tried my hand at upholstery. I next discovered my lifelong passion—custom quilting. What a way to go ... there is never enough time to design and sew! 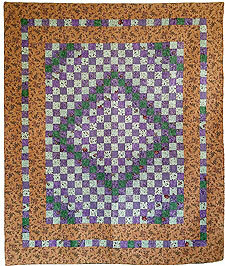 I began leading quilting workshops in 1986, teaching people of all sewing abilities. Helping them design their own custom quilts with the fabrics and colors they like best is a real joy for me. Many former students come back simply to share the camaraderie of fellow quilters while working on their own custom quilts. My Memory Quilts are ... memorable! I've used sorority T-shirts, men's old ties, and other fun items. I made a quilt for my son featuring snowboarding competition bibs and another for my daughter using handkerchiefs that belonged to her grandmother. The ideas are endless!